Choose your primary chenille and back felt color "That's it! Equals lower prices and faster production. Choosing your patch colors? Think from the top down and from the center out. 1st.primary,2nd. detail color, 3rd stamp felt (optional), LAST: back felt. "That's it! Please keep patches in a single order colored alike. now owned by,Rennoc, Neffco. Mfg in Domican Republic. we will talk to you!! Hopefully that makes some difference. Know your colors!. Click here before ordering. Returns not accepted for color misorder. Jackets are custom made to your order, All are the FINEST quality available in the world. Choose from many colors. see pdf color samples. Genuine natural top grain Cowhide leather sleeves. Vinyl is finest naughahyde for genuine leather like appearance. Thermal quilted fiber insulated lining *option zipper lining for easy access. Rock Creek offers multiple sleeve, knit trim patterns & collar style selections. Adult = Sizes XS to 6XL. All jackets are custom made to your order and subject to strict return guidelines. Normal production time for blank jackets is about 4 weeks starting Tuesday after processing to ship date. *Mascot and specialty patches require art approval prior to production*. You may consider attaching patches yourself as fully decorated jacket delivery may take addition time. Order the QZL zip open lining for easy attachment access. 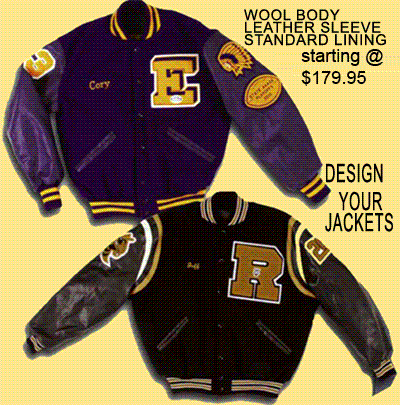 All chenille letter jacket patches are custom manufactured for your order.